(Bloomberg) -- Alberto Tocchio is getting out of stocks before systematic traders swoop in and spoil the party. A $140 billion wave of computer-driven buying may hit U.S. and European equities as soon as this month, says the chief of Heron Asset Management, a Switzerland-based family office with 2.5 billion Swiss francs ($2.5 billion) under management. Rather than a bullish confirmation of the upward trend, the deluge amid thin liquidity could quickly push the rally into overstretched territory against a backdrop of weak growth, according to Tocchio. Tocchio has already reduced his equity exposure to 55 percent from 130 percent at the start of the year on valuation and recession fears. If the influx from CTAs and volatility-targeting funds turns out as sizable as he predicts, he could cut stock holdings to below 10 percent this month. The fund manager says that poor liquidity will give an outsize impact to these quant billions, powering markets up and just as quickly deflating them. It’s a common enough assertion these days, as computerized traders turn into reliable whipping boys for outbursts of volatility. Tocchio is planning to buy put options on major stock indexes to hedge a downturn. Global stocks defied trade tremors, growth warnings and even an inverted yield curve to deliver the best first quarter since 1998. But Tocchio isn’t the only one worried the rally is running past its expiration date -- an environment where poor liquidity could quickly turn things ugly. Pictet Asset Management is going underweight equities and overweighting cash amid worries about an aging business cycle, according to Luca Paolini, chief strategist. Valuations are “at odds with our downbeat expectations for corporate profit growth,” he wrote in a note last week. While there’s less euphoria in markets compared with January 2018 according to a relative strength index, the S&P 500 has butted up against overbought levels several times this year. JPMorgan’s Marko Kolanovic highlights the role of thin liquidity in explaining why markets have plummeted and bounced back with such alarming rapidity since last year. Tocchio, who manages the 29.4 million euro ($33 million) Enhanced Equity Exposure fund, is unique in seeing a sell signal from systematic traders. Low volatility and the fact that U.S. stocks are rallying toward records suggest CTAs look poised to up bullish exposures. But the view that their buying behavior is a reliable contrarian indicator isn’t shared by all. Trend-followers like CTAs take a position in securities only after a trend appears in the price data, typically holding from a day to a few weeks. Other systematic strategies such as volatility-targeting portfolios buy or sell stocks based on historic swings. 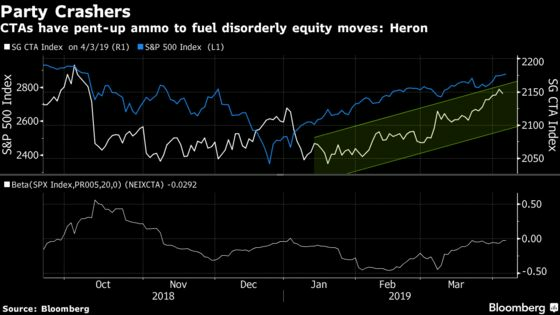 Trend-followers were short at the start of the year after December’s rout and have turned “moderately long’’ on stocks since then, according to Wells Fargo’s equity derivatives strategist Pravit Chintawongvanich. Funds that take their cues from volatility are around 35 percent allocated to the asset class and could ramp up from here. Nomura’s Masanari Takada pegs the amount of computer-driven buying that could come at a more conservative $49 billion, making the quantitative strategist more circumspect about their potential impact on the market. “Their buying indeed means the upward momentum of global equity could go to ‘over-bought’ status,’’ said Takada. “But there is room for them to increase systematically their exposure” as long as trends hold and volatility stays low, he said. For Tocchio, whose fund is up 10 percent this year, it’s worth the risk. “I’m worried about missing out on returns if the rally continues, but my main concern is to protect our performance and to protect the clients from big spikes in volatility,’’ he said.